We Compare the Elliott Welding Screens … so you can choose what’s best for you. At Elliotts, we provide the best protection for your workplace. Our Welding screens ensure that you are covered, our screens are the only ones in Australia certified to Australian Standards. ArcSafe welding screens absorb the dangerous ultraviolet light that is emitted from the arc welding process making it the perfect option for a shared workspace where not everyone will be wearing welding appropriate PPE all the time and because the ArcSafe® welding screen is transparent it allows workers to see if it is safe to enter the area. Static and mobile frames are available in a number of sizes in standard and heavy-duty material. Product Certified: Elliott ArcSafe welding screens are certified to Australian Standard AS3957/NZ5852:2006 Light transmitting screens and curtains for welding operations by SAI Global. ArcSafe welding screens are available in two colours: Red and Green. The Luminance Transmittance is the ratio of the luminance of a source of the light when viewed through a curtain or screen, to the luminance of that source when viewed directly. Similar to the ArcSafe Welding Screen, the FR Canvas Screen absorbs the dangerous ultraviolet light that is emitted from the arc welding process making, although the FR Canvas is more robust and durable. Its additional thickness in material allows for the Canvas Screen to be able to withstand splatter and dross. Static and mobile frames available in a number of sizes in standard and heavy-duty materials. 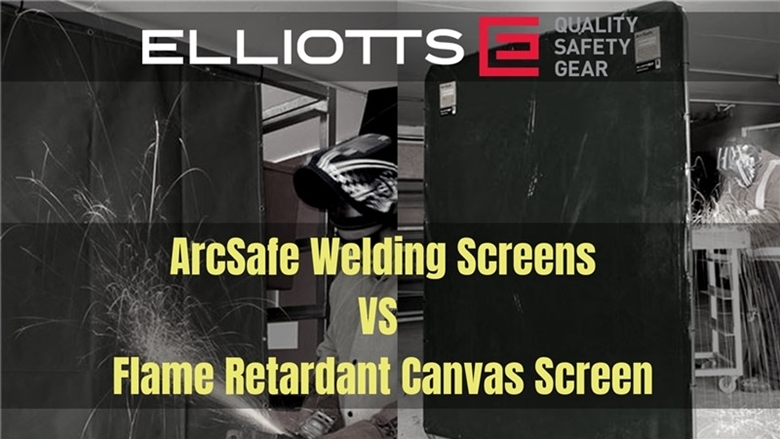 Whether an ArcSafe Welding Screen or FR Canvas Screen is the best choice for you, Elliotts has the quality safety protection you need. For more information, see our Welding Screens, Blankets and Drapes page or call 07 3265 2944.